Last week, I was sitting in a meeting with some of my colleagues at Doctors Health Press and we were talking about exercise. Exercise is often a point of contention in the health world—not because it doesn’t have all kinds of benefits, but because people don’t necessarily want to do it. There are a number of reasons for this. First, exercise requires a certain degree of knowledge or skill. Secondly, it requires time and effort. Finally, it’s usually recommended without any specificity (other than for heart health, blood pressure, diabetes, obesity, osteoporosis, back pain, sarcopenia, etc.). Now a new large-scale analysis is showing how the Ancient Chinese exercise technique of tai chi is helpful to people who suffer from multiple chronic conditions. A recent report in the British Journal of Sports Medicine looked at 33 articles and 24 studies featuring nearly 1,600 participants. The report concluded that tai chi is an effective relief treatment for people suffering from breast cancer, heart failure, osteoarthritis, and chronic obstructive respiratory disease (COPD). Furthermore, it was found to help people with one or more of these conditions and did not cause any additional pain or breathlessness. But Exactly What Is Tai Chi? Tai chi emphasizes slow, gentle, flowing movements that can aid in muscle strength, control, power, balance, and posture. It is not vigorous and is suitable for people of most health conditions and all ages. For example, the average age of the study participants ranged from the mid-50s to early 70s. Aside from the physical benefits that can aid in pain relief, tai chi also focuses on mindfulness, relaxation, and breathing to create a somewhat active meditative state to encourage pain relief. Performing tai chi for an hour two to three times per week (for at least 12 weeks) can help improve muscular endurance, strength, flexibility, pain, stiffness, control, speed, and breathing in people with the chronic conditions mentioned above. 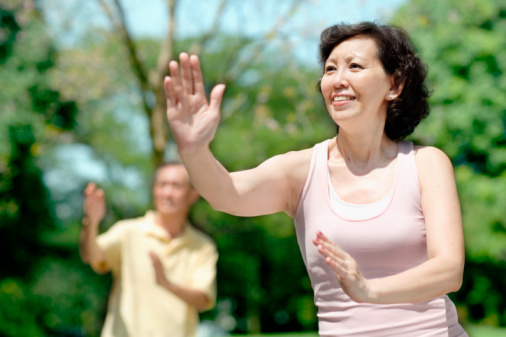 Like any form of exercise, tai chi requires time, commitment, and a skillset. The key to success will be committing to learning the technique to properly perform movements, which is best done in the presence of an experienced instructor. In a world where we’re looking for fast treatment and instant gratification, natural treatments offer a breath of fresh air. Tai chi is unique because of its multifaceted and concurrent emphasis on activity and mindfulness. Natural and complementary treatments are highly desired as an alternative to pharmaceuticals, but the truth is they aren’t as quick in their results. The end result takes time, but it’s also important to remember these kinds of treatments often offer the greatest benefit and few—if any—side effects. If you’re looking for relief from chronic illnesses like COPD, heart disease, osteoarthritis, and/or breast cancer, consider tai chi as a way to improve your quality of life.